Hey there! Check out the Tutorial Reboot! 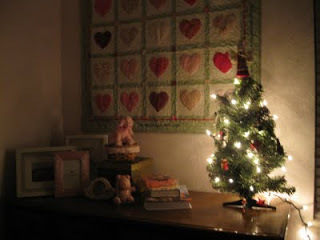 Is your mini-tree naked? Are its feet cold? 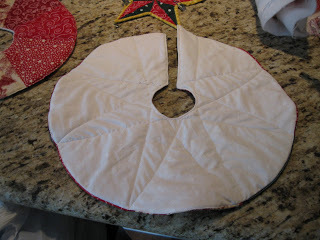 Well add some modesty to your tree and wrap it up in a wee quilted tree skirt. 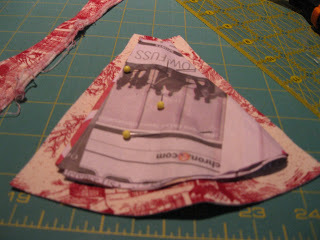 This is a fairly easy and quick project. It took me 2-3 hours to complete. I like getting things done, don’t you? To start, you will need a pattern. 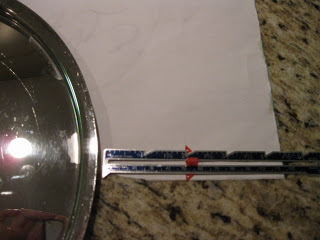 I used a large pot lid to trace a half circle on a piece of paper. 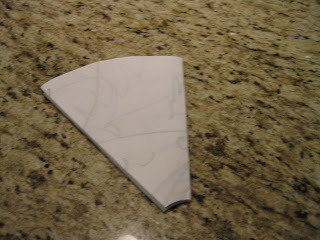 (Newspaper or tissue paper work better than plain white paper, but I worked with what I had.) Since, I wanted my skirt a couple inches bigger than the lid I measured two inches longer. 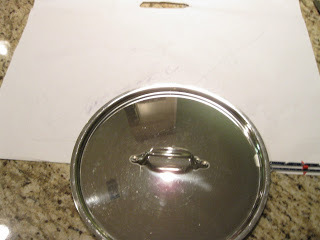 I made tick marks every few inches around the lid. 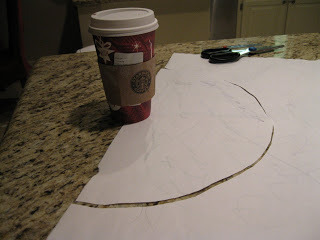 Once you have your half-circle cut out, you will need a smaller half-circle in the center. I used my coffee cup to trace a smaller half-circle. See picture below. Once you’ve done that, cut it out. 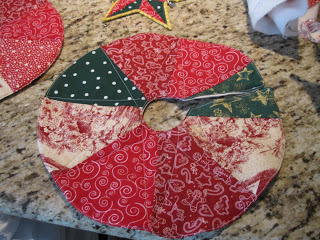 Once you’ve got your half circle cut out, fold in half twice. 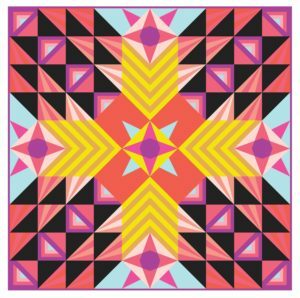 You will get something like the pattern pictured below. I stapled it to keep it from slipping, but you can use a pin. 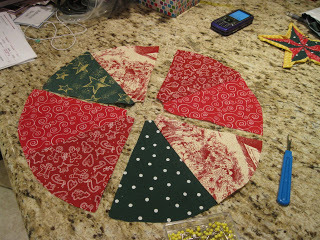 Using your pattern, cut out 8 pieces of fabric. In the picture below (hey! I found some newspaper!) 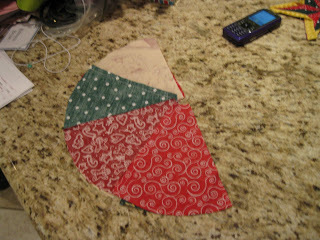 you will see that I added 1/4 seam allowances. I guesstimated these as opposed to tracing. Also, you don’t have to add seam allowances. 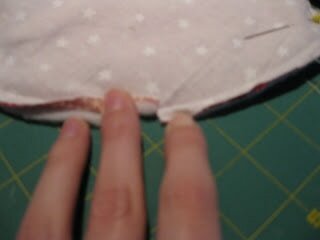 Not adding seam allowances will make your final product smaller. So you decide. I made one each way. 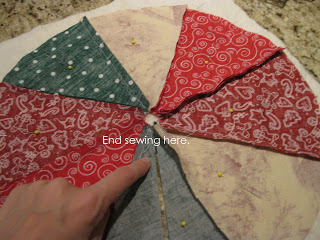 If I had to do it over again, I would add seam allowances. 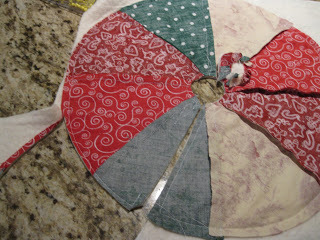 Once you’ve cut your 8 pieces of fabric, arrange them how you want. Here’s what I did. I used 3 different reds and 2 greens. Next line up your pieces as shown below. You will have four pairs of fabric. Once they are lined up, machine sew on the right side. Press to the right. 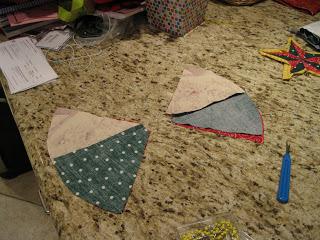 Line your pieces as shown below – you will now have two pairs. Machine sew right side. Press seams to the right. Now you should have two half-circles. Now you will have a completed circle with a hole in the middle. I see mine didn’t come out the way I lined it up, but that’s probably because I wasn’t consistent with which side I sewed. I told you to sew on the right hand side, but I probably did left one time. Whoopsie daisy. No matter. We live with mistakes in this house. 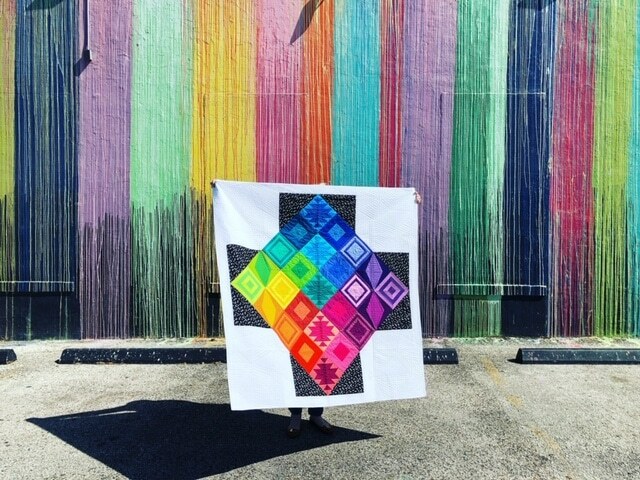 Ok, we are ready to quilt! 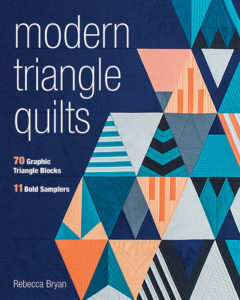 Now, you will make your quilt sandwich. We are going to do a pillowcase binding. You want to lay your batting down first. Then your backing goes second, or in the middle. (If you were making a cheese sandwich, the backing would be the cheese.) Lay your backing so the right side is facing up. 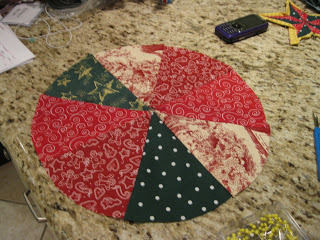 Finally, lay your pieced-top right side down. So, you will be sewing the right sides together, with your batting underneath that. Pin together, all the way around the circle. 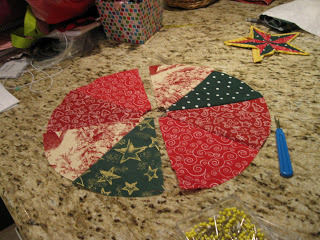 Please note the following quilt sandwhich is wrong (so wrong!) and if you do it this way you will be disappointed and frustrated, like I was! Note how the backing and batting are in the WRONG places. 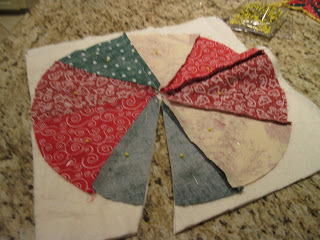 Before we start sewing you will cut you quilt sandwich. 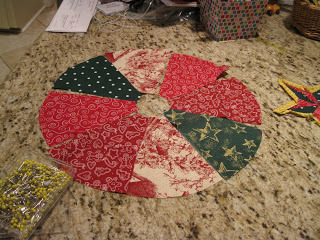 This will be the opening for the tree skirt. You will cut on one side, a radius if you will. It should look like this. A round of cheese (hmm must be hungry). Now, we are going to sew our sandwich together. So exciting! 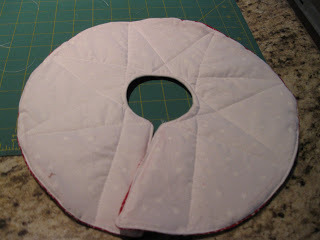 You are going to sew all around the inner and outer edges of your circle and on the edge of one of the cut, using a 1/4 seam is fine. You will want to put your machine in the needle down position. This will make it easier to pivot on the corners. Ok, I’ll wait. 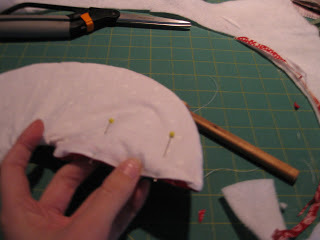 Go sew all the way around the edges, leaving an opening. 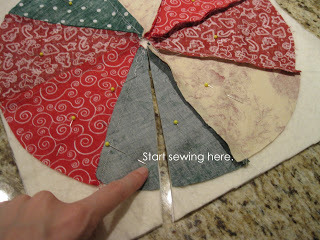 Your sewing might look something like this. Don’t forget to trim the corners. This will help you get a sharp corner once you turn it right-side out. Also, you may want to clip around the edges of the circle as shown in the picture below. I thought this would help it lay flat, but I forgot to do it on one and it didn’t seem to matter. So you decide. I would do it (if I remembered!). But do do the corners (hehehe do do). Now, you will close up the opening. Pin the opening as shown in the first picture below. 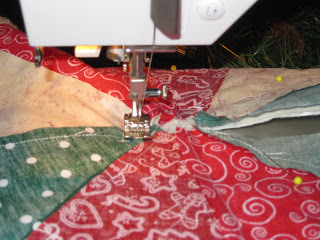 Using a small seam allowance, like 1/8th inch, machine stitch (can be done by hand) the opening closed and then continue top stitching allllll the way around the quilt, shown below in the second picture. 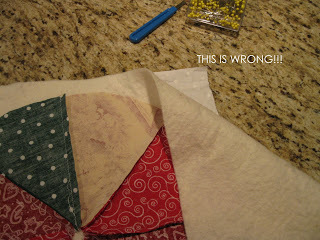 Here’s a picture of top-stitching close to the edges all the way around the quilt. 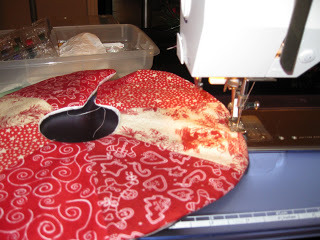 This is the last step of pillowcase binding. 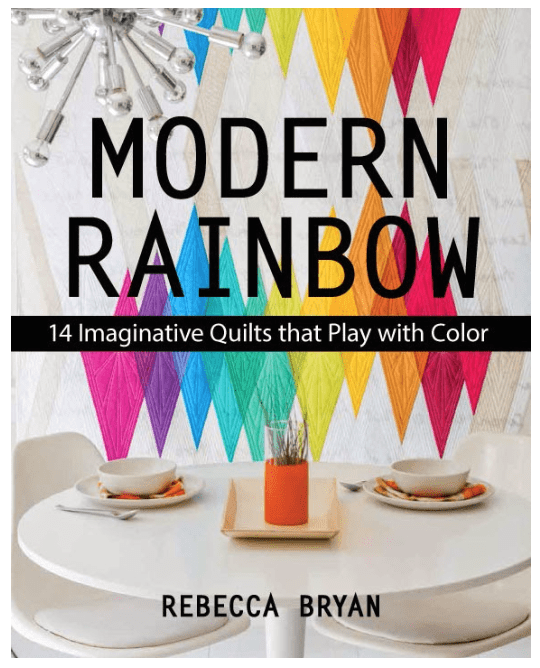 Now, you can quilt it. You could stitch in the ditch. 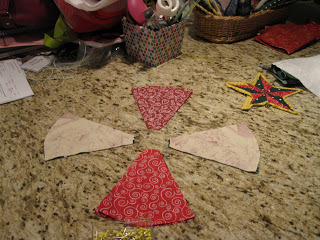 Or if you are really good you can free hand some holiday themed things like a bell or a word. I just sewed from corner to corner. It turned out nice and ended up looking like a Lemoyne (8-pointed) star. The back on the other one. 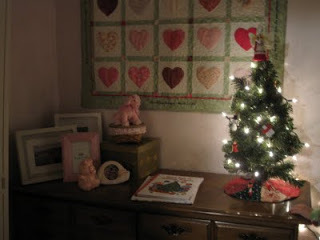 And here it is warming the feet of my dear daughter’s mini-Christmas tree. Cute! 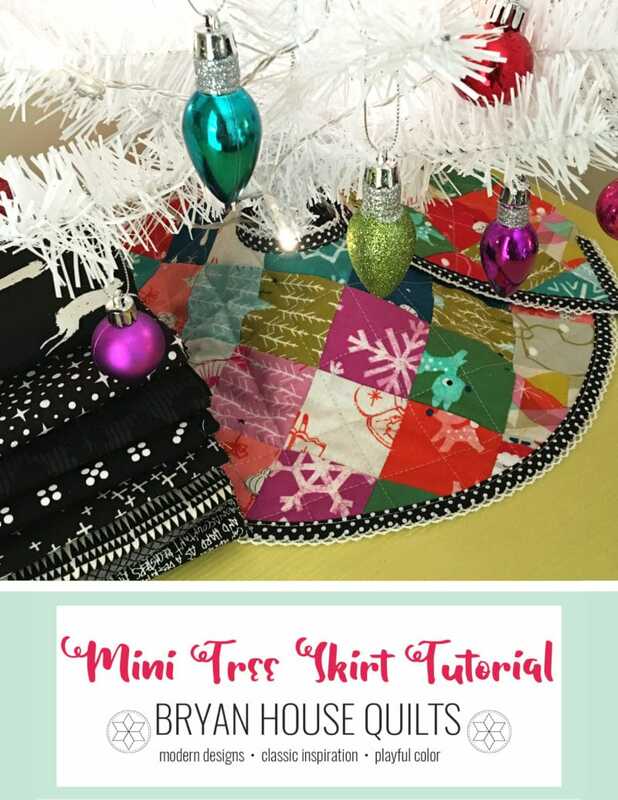 You could also use this same tutorial to make a tree skirt for any size tree. The size depends on how big your pattern is. I will answer questions in the comments if there are any. I tend not to be clear…. By the way, I almost picked this layout for my blog. Love it!